Sarabeth Pollock: First of all, congratulations on so much exciting stuff going on right now. In [Harley Quinn] Issue 26 we get the hair! Jimmy Palmiotti: We’re acknowledging it, the movie, and we thought because of Issue 25 she had the blow out with the Joker. It’s sort of like starting a new day, and a new day for Harley means new clothing, a new hairdo, like any woman or anybody that’s been through something. They want to go and clean it up and change. Like now I have the chance to be this person because that person is not my life anymore and that’s what she does in 26. So we thought Margot Robbie looks awesome with that haircut so why not throw it at Harley. I mean, we change her costume every issue so what’s the difference? Amanda Conner: So she might have a new hairstyle next winter! JP: We’re always changing it. She’s one of the iconic characters that as long as you keep to the red and black theme and the diamonds you can actually manipulate any kind of clothing. AC: Like most girls with a closet full of stuff. SP: Right, and she does it so well. No matter what, even bowling. SP: And I have to say, the Loot Crate issue—how much fun did you have coming up with anything that can happen happens? JP: Anything can happen. The Genie is the best thing to throw into a comic and we were laughing because we’re also big I Dream of Jeannie fans from way back when. And so we had the genie and then we were like “Ooh, we can do anything.” What was your favorite part? SP: I’d say when she’s wishing she was more “well endowed” and then as soon as her wish is granted she falls on her face. You watch the women on The Housewives of Orange County and wonder how they stay upright. For Harley, it’s asking for the wrong thing or the right thing in the wrong way. Like a million bucks, literally, or in that episode of The Twilight Zone when the guy asks for a million dollars and then the IRS shows up. You have to ask for the right thing and she’s always one step behind. JP: Yes, except with the JLA. She went up there and of course we had to pull on Superman’s cape and pants Green Lantern. AC: Someone was saying Harley was sexually harassing the JLA. Oh my God! JP: I didn’t think of that when we were doing it. I just thought what’s the fun you could have? AC: She’s just pestering them, yeah. JP: And actually I don’t know if you caught it but she presses the button for them to come out of orbit and if you look on the last page they’re like “Oh, a shooting star.” That’s actually the JLA Tower going by. JP: It’s real subtle but it’s the JLA coming out of orbit and burning up. SP: So let me switch gears a little bit. Harley does so many things. She’s probably the most complex character, more so than even Batman. It’s probably harder to write her than a guy like Batman. AC: It’s more fun to write it because she is so complex, you know. SP: Is there ever a point when you have to stop and say that something is too good or two bad for her? Or how do you figure out what she wants to fight for, like the animals early on. That’s such an unusual cause. JP: Oh, and she has a thousand parakeets that show up once in a while and they like her and they come in at weird times. I actually have them in a new issue. AC: We’ve taken what has always been with Harley and just sort of ran with it. Because back in the day she had the hyenas, right, so she’s an animal lover. AC: So we just took that and ran with it. JP: I would almost say she tried to be a vet at some point. JP: Before going into psychology she probably tried to be a vet at some point, probably messed that up, but you know we don’t harm pets, we don’t harm animals. Except between two pieces of bread when we’re hungry. SP: Bernie has it bad, though. AC: Bernie is her common sense. JP: Yes, and we want to show she’s got a good soul, you know, it’s in there. She wants to do right but there’s a point where the switch goes off and it’s not like she becomes this massive killer or anything. She just looks at the shortest distance between her and the problem and just goes for it. Sometimes it’s with a mallet, sometimes it’s driving a car off a cliff, whatever it may be. So although it’s an intricate character, she’s also a wish fulfillment character for writers because whatever we come up with we can kind of work into her personality as long as we stay true to her. There’s a fine line even with her relationships with Ivy and her friendship with Tony. These are friends. These are people who have each other’s backs. AC: She’s a loyal, loving person who happens to be a psychopath, you know. We sort of keep to Wile E. Coyote rules with her. We do have a certain amount of rules with her. JP: Although the Loot Crate one we just sort of went crazy. AC: But the rules are still there. AC: I love drawing and I don’t get to do it as often as I used to so I was like I’m doing this! JP: We hope so. We hope they get it and think “Let’s see what else they got” or “let’s walk into a comic store.” So we saw the opportunity and thought this was our chance, better than advertising to get people to try something new while they’re putting on their wool hate and t-shirt and button from the box. So we hope that works. SP: Speaking of people wearing things, you see all of the people walking around the con and all of the different iterations of Harley going back 20 years. SP: What do you think the appeal is for young girls, women, men, even pets…. Out of all of the members of the Rogue’s Gallery, why her? AC: Here’s my theory. I don’t know if I’m right about it. JP: You’re always right. It’s a husband thing. AC: Good answer. It’s like when you see her and she is so perfect and she’s so iconic, she’s so hard to identify with. We all want to be her but it’s impossible to be her. But Harley is full of flaws and she’s messed up and she eats a lot of food and she goes to the bathroom and she has to clean up after her animals, and she’s easy to identify with. And then there’s that wish fulfillment thing that we talked about where if you’ve ever been in traffic and some jerk cuts you off and you fantasize about having a rocket launcher on the hood of your car just like her. You know, she’s the kind of person who would have a rocket launcher and she does things we wish we could do. JP: And I also think she brings out the designer in people because we have her in different outfits. A lot of people who are saying I’m going to come as Harley but I’m going to do my own thing where I do this or I’m going to do that to my hair but it’s still Harley and I think to cosplayers the most exciting thing is they don’t have to stick to exactly every single thing. They can build on it and own it and I think that’s the appeal that no other character has. There’s no other character that has so many different versions as Harley. There’s really no other character I thin. You could do Vampire Harley, you could do Transformer Harley. AC: We’ve seen Zombie Harley, we have seen Bride Harleys. JP: Brides. A lot of Bride Harleys. AC: And little tiny Harleys that are adorable. SP: Lastly, if you guys could do one thing that’s maybe not even canon, possible somewhere in time or in history, if you could plug her in somewhere, where would you want to see her? AC: I would like to see Harley at my New Year’s Eve party…oh, wait. JP: What does that mean? I don’t know what that means. AC: Well, if a genie put her anywhere, that’s where I would put her. JP: Oh, okay. We have, in Harley’s Little Black Book, we have an issue coming up with the Bombshells. Is that announced? DC Comics Powers That Be: Announce it! JP: All right, anyway she’s with the Bombshells. Something happens where she goes back in time and it’s sort of bizarre wish fulfillment but she kind of goes after Hitler at one point. I don’t want to ruin it too much but let’s just say she’s with him in his final hour. And, you know, she’s maybe responsible for some things that happen. But since it’s an alternate kind of issue we’re having some fun with it. So that’s when I got to put her back in time. AC: We’re gonna get in so much trouble! JP: I mean, I’d love to have her back with dinosaurs as the only woman on earth and only dinosaurs, but I also think the future with Mandy and Harley as the only people left and Mandy would be running away from her the whole time. There are a million stories! And it’s so true. With the advent of DC Rebirth (not afterbirth, as Conner suggested during the panel) there is a whole new world to discover with Harley Quinn and all of her friends. Check out the next issue of Harley Quinn at a comic book store near you! I love Las Vegas, and I love going to cons. 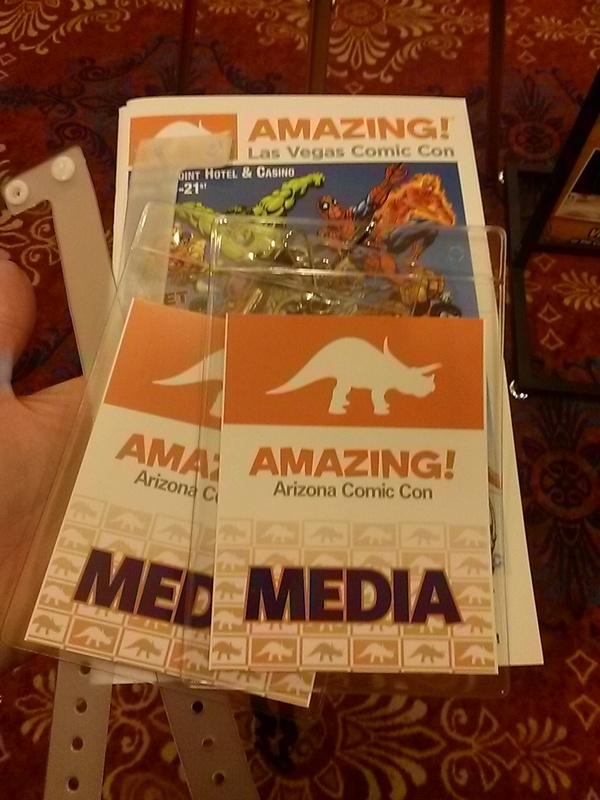 Amazing Las Vegas Comic Con is the sweet spot. 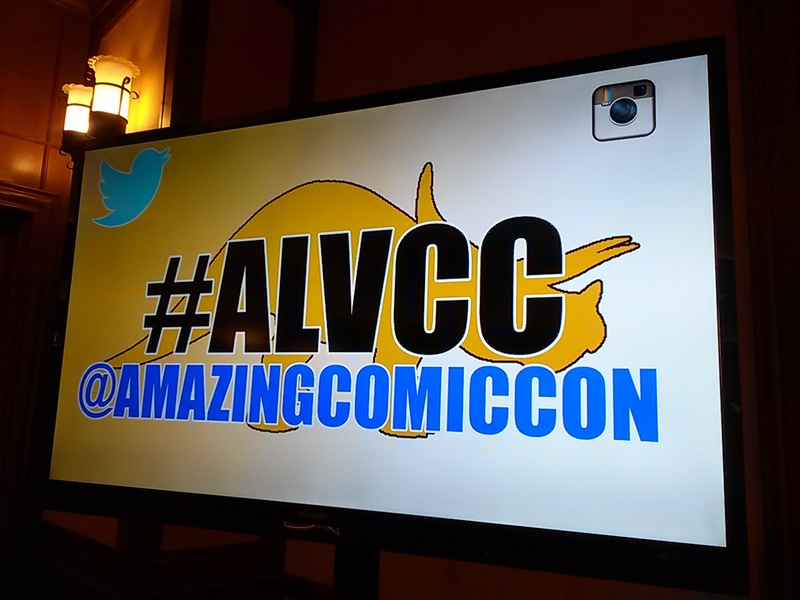 ALVCC was my favorite event of 2015, and this year promises to be bigger and better than ever before! Don’t believe me? I have proof—ALVCC has outgrown its home at the South Point and will be taking over the Las Vegas Convention Center June 17-19. This year’s special guests include Deadpool creator Rob Liefield, Teenage Mutant Ninja Turtle creator Kevin Eastman, Marvel legend Chris Claremont, and Civil War artist Steve McNiven. VIP ticket packages range from $150-200 and are on sale now but will sell out quickly. General admission tickets went on sale today. The full three-day package is only $60, making it one of the best deals out there. 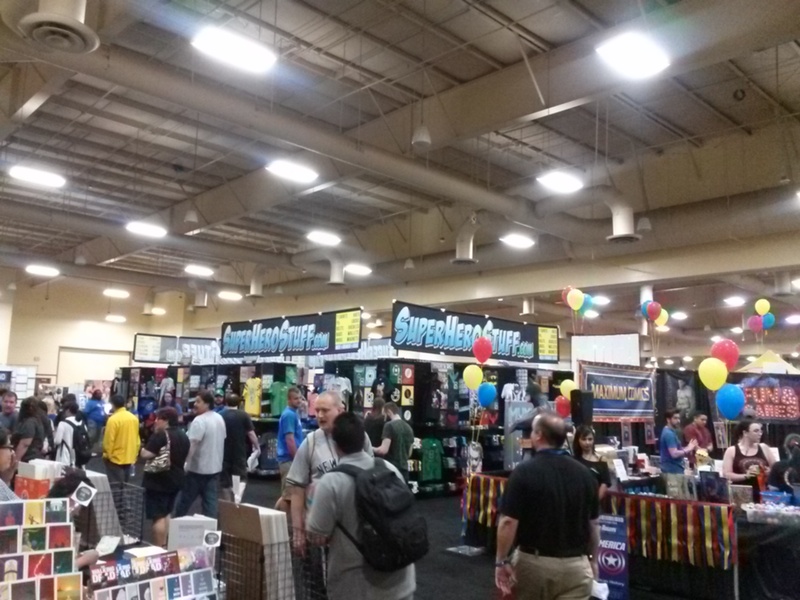 With great panels, awesome special guests, a huge artist alley and cosplay galore, Amazing Las Vegas Comic Con needs to be on your calendar this June. In a (completely non-scientific) poll by the San Diego Union Tribune, a majority of San Diegans favor keeping San Diego Comic Con over the San Diego Chargers. 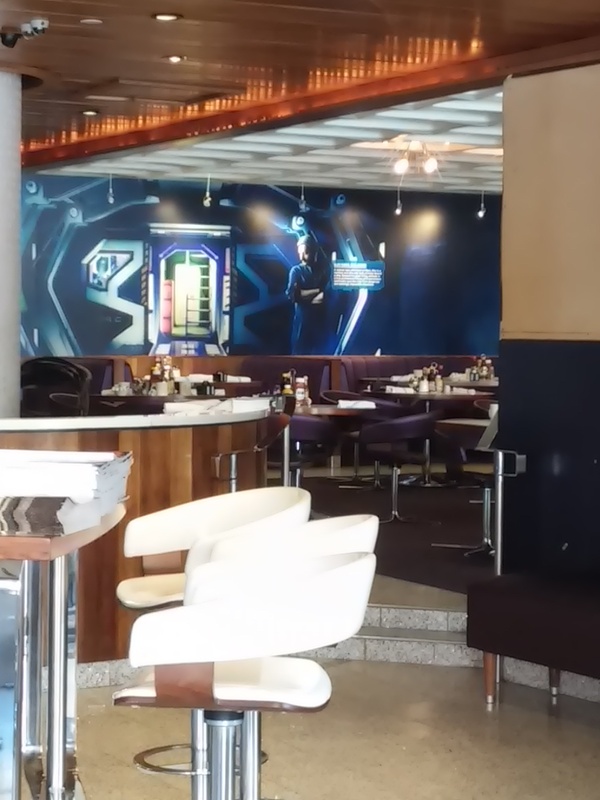 Clearly, the public sentiment in San Diego is changing amid clandestine backdoor dealings between the Spanos family and Carson, and special counsel Mark Fabiani stalling talks between the Chargers and the city. Where there was once a fierce battle cry over the loss of our beloved football team, now there’s a bit of healthy suspicion caused by the team throwing shade to its Bolt Faithful. If they want to stay so much, why are they doing so much to leave? 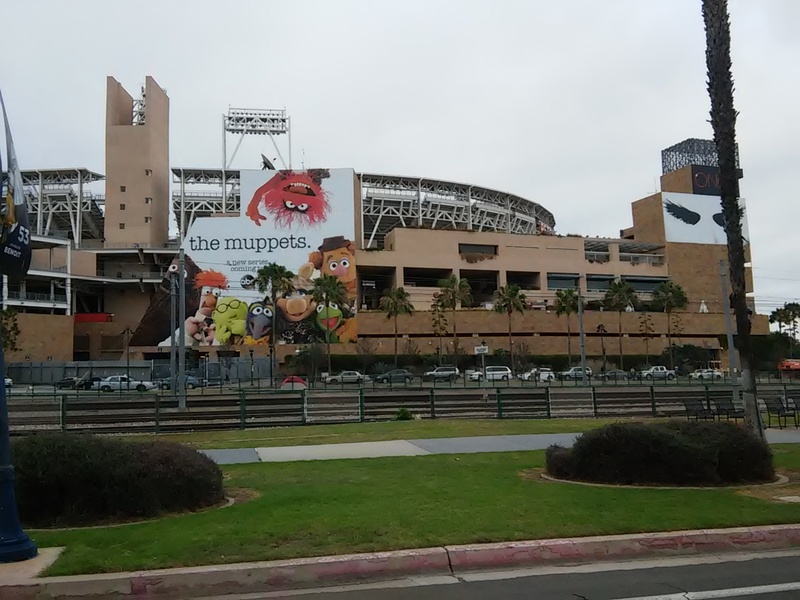 There’s no real way to determine the amount of money the Chargers bring the city, but I’d imagine that the Chargers aren’t exactly a cash cow for the tourism industry in San Diego. While it’s true that landing another Super Bowl would lead to economic prosperity for the city, hosting duties only come every so often, and our Chargers aren’t exactly Super Bowl contenders. There aren’t many people who come to San Diego eight times a year to watch the Chargers play. At this point, we’d be building a stadium to appease the Chargers…and to profit from all of the other non-Chargers events held in it. SDCC, on the other hand, brings in over a hundred million dollars to local businesses every year, with the annual revenue on a perpetual uptick. 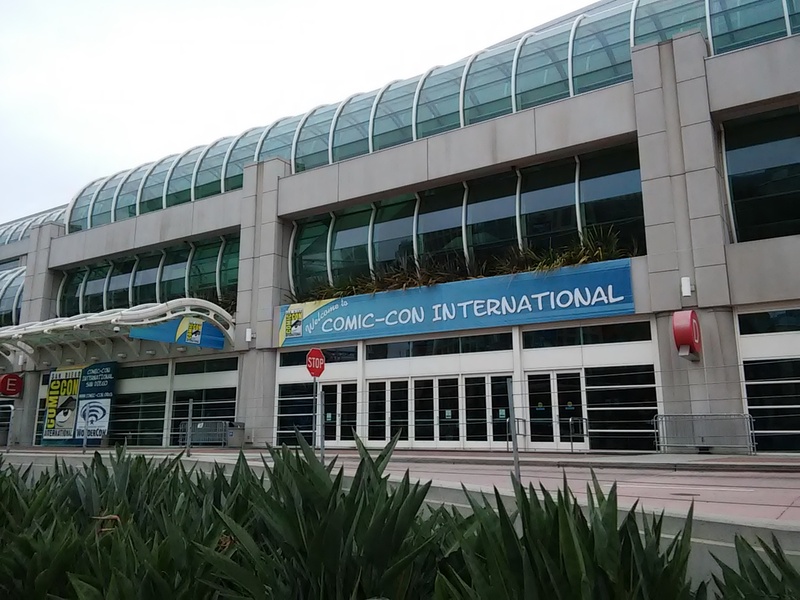 SDCC is a huge cash cow, and the city would be foolish to let it go. 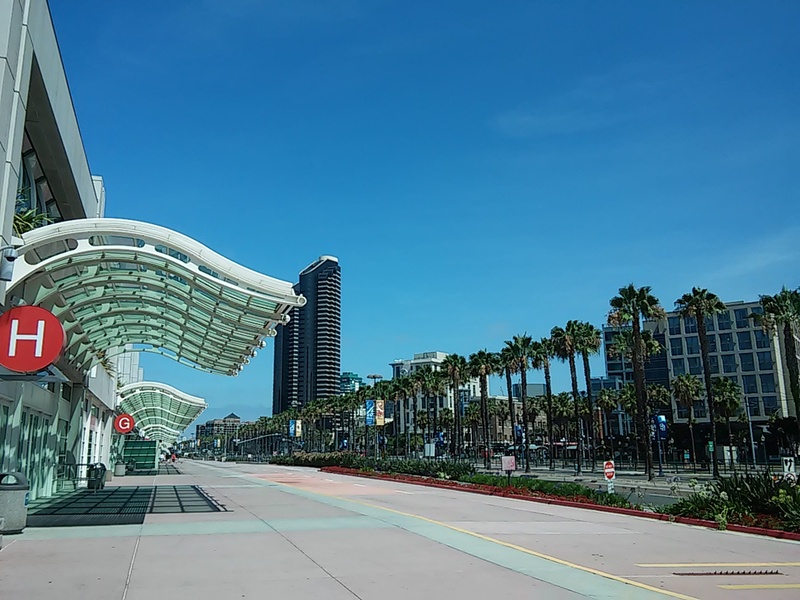 Every bit of the Convention Center expansion would be worth its weight in gold, and not just because of SDCC; the recent Cisco convention, though smaller than SDCC in terms of participants, brings in as much (and possibly more) money to local businesses than SDCC. As a native San Diegan, avid sports fan and card-carrying nerd, I feel bad about the Chargers, but they’re not exactly helping their cause. Leaving San Diego seems to be a done deal. 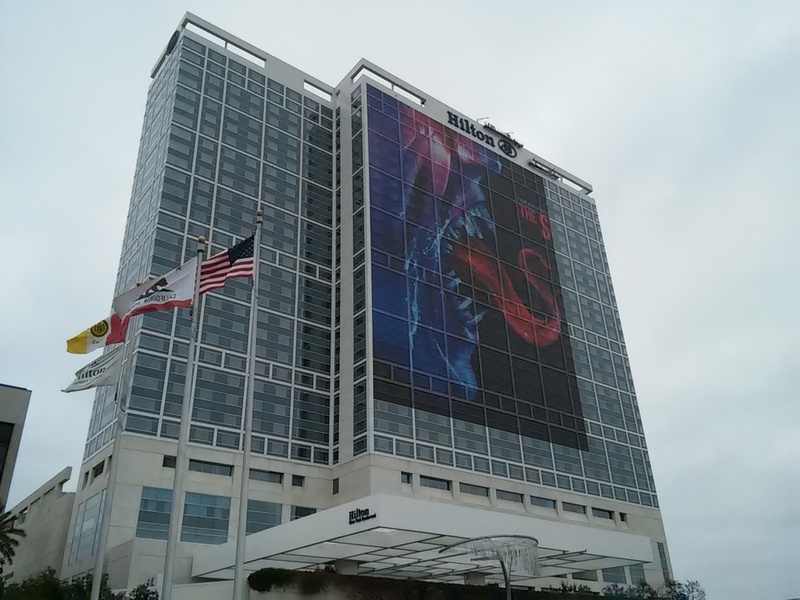 (Remember, they’ve been secretly working on this since 2013) SDCC was born in the basement of the El Cortez Hotel, and the Powers That Be want it to stay in San Diego. 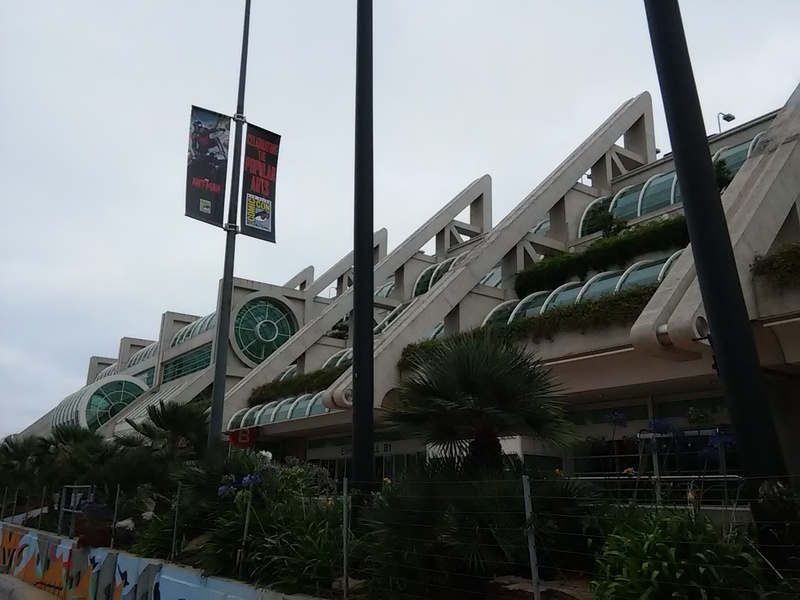 Unlike the Chargers, SDCC can demonstrate how they impact San Diego’s economy. San Diego businesses fully support SDCC and [most of them] cater to SDCC because SDCC does so much for them. If a deal can be made to keep the Chargers, and if it makes sense for the city, then I’m all for it. 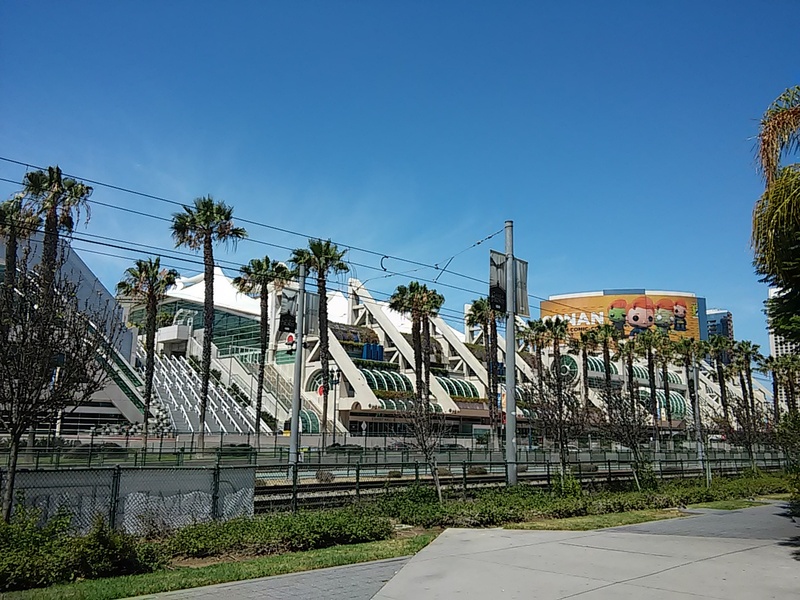 However, at this juncture, now that SDCC has committed to staying in San Diego through 2018, I believe that we need to shift our focus to make sure the Convention Center expansion happens soon so that we never have to have the “should I stay or should I go” conversation with SDCC again. You can read more about the UT poll here. It’s the Friday before San Diego Comic Con. It’s a beautiful San Diego day and preparations are being made all around the Gaslamp. 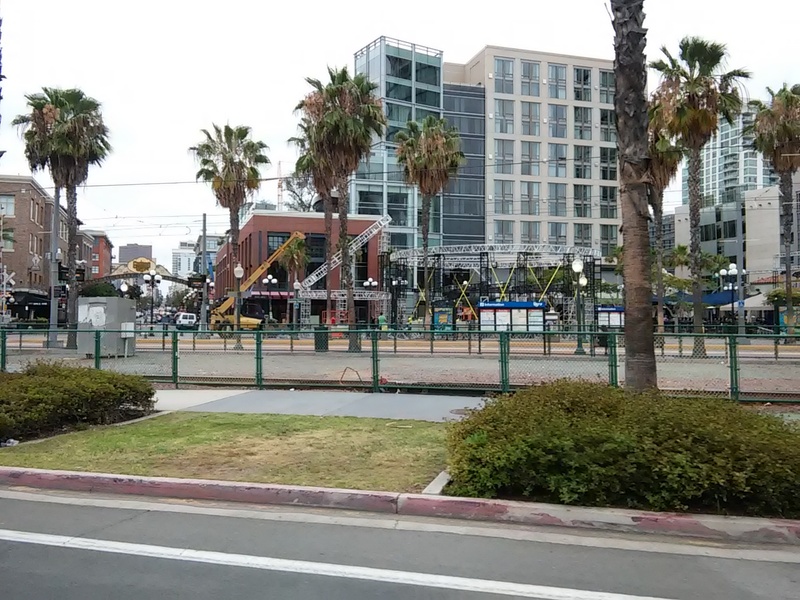 One thing I’ve noticed is that it seems like the SDCC fervor has been impacted by the July 4th holiday; preparations are moving at a slower pace because so many people are celebrating the holiday in and around the Gaslamp. However, come Monday the Convention Center will be a hub of activity. 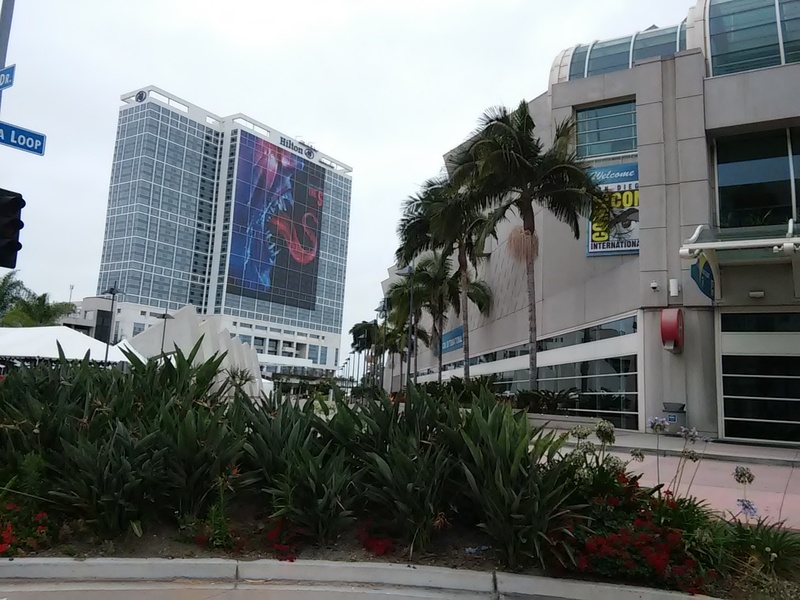 The Convention Center looks eerily empty given how it will look at this time next week. Hall H is wide open. 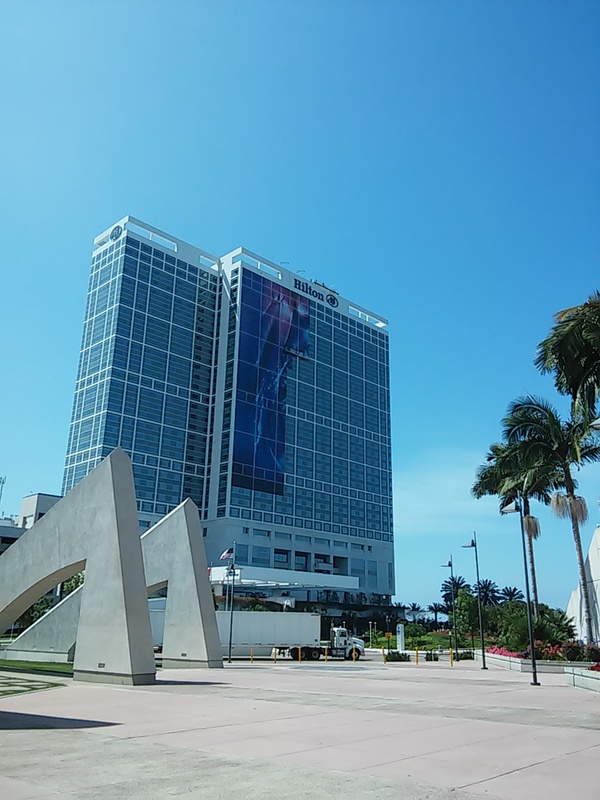 The San Diego Hilton Bayfront is getting wrapped as we speak. 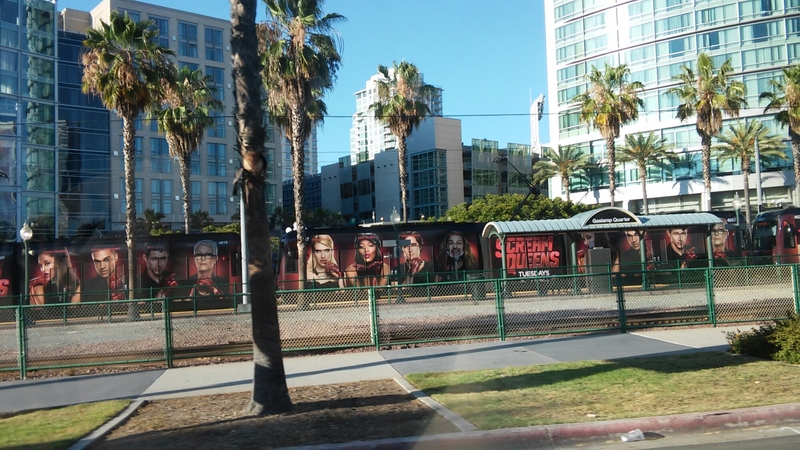 The MTS Trolleys have been wrapped in Scream Queens, Conan, and The Muppets. 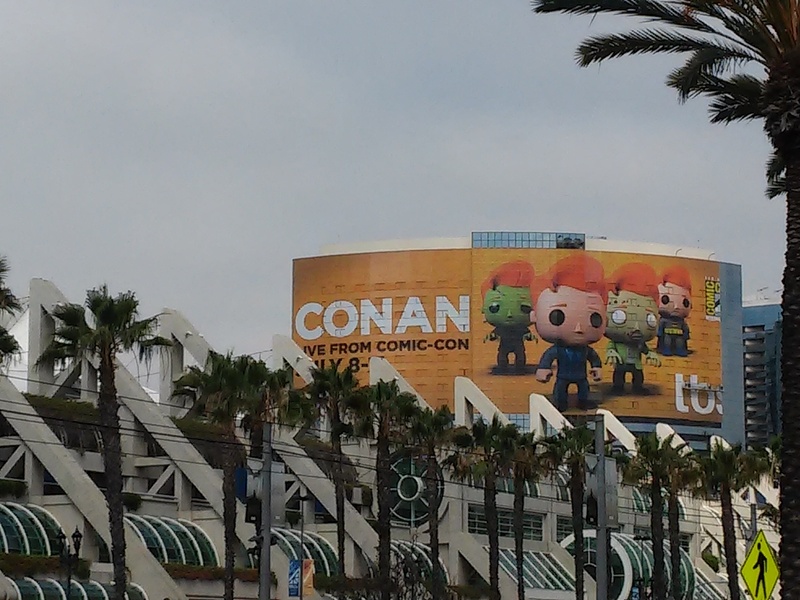 It’s a beautiful day…and you can almost feel the SDCC buzz…. I arrived in Las Vegas on Thursday evening. My plan was to have a day to relax prior to the convention, and this was a great idea. It’s important to pace yourself in Sin City. Friday morning I woke up, got some work done, and had a nice buffet lunch. Press passes were available at noon, but a very helpful staffer gave me the program guide early so I could study it over lunch. By 3pm the South Point was buzzing with comic con fans. Seeing Elsa from Frozen in the casino surrounded by excited kids on vacation gave me a hint of what was to come. The ALVCC Exhibit Hall took up the entire South Point convention area, as well as part of the arena concourse. They also used concourse space for the main panel room, which was very convenient, but not very practical. (More on this later) Given the excessive heat outside, you’d think it could be warm inside, but it was actually quite comfortable in the massive Exhibit Hall. At times it was even chilly in there. Even at the busiest point on Saturday, the con floor was never unmanageable. The event organizers did a great job with spacing the booths to allow for easy crowd flow; there was an open perimeter around the outside to allow for ease of access when you needed to go quickly from one end of the room to the other. 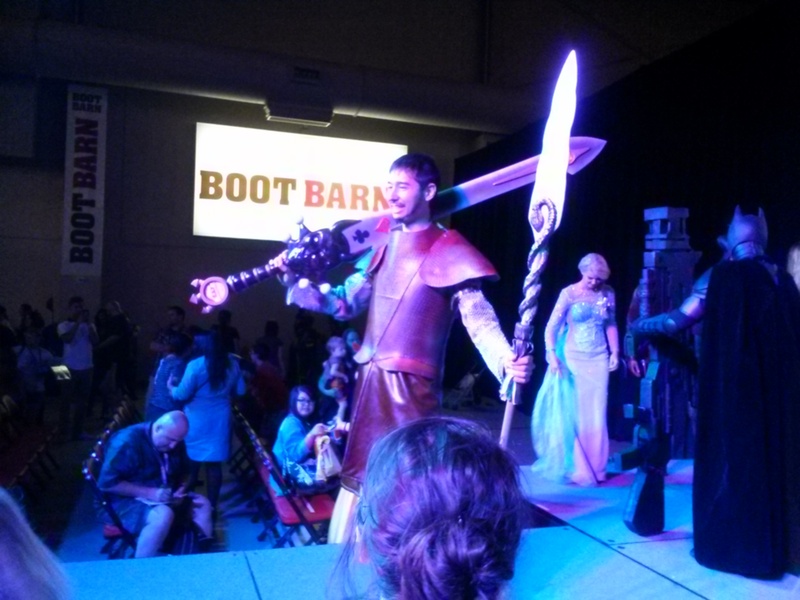 ALVCC boasted over 200 artists in Artist Alley. There were two rows of spaces that spanned from one end of the Exhibit Hall to the other, and artists were lined up on both sides. At times it was overwhelming to see so much great art displayed at once because it made choosing what to buy even harder. In addition to Artist Alley, there were over 150 exhibitors selling must-have toys and collectibles. 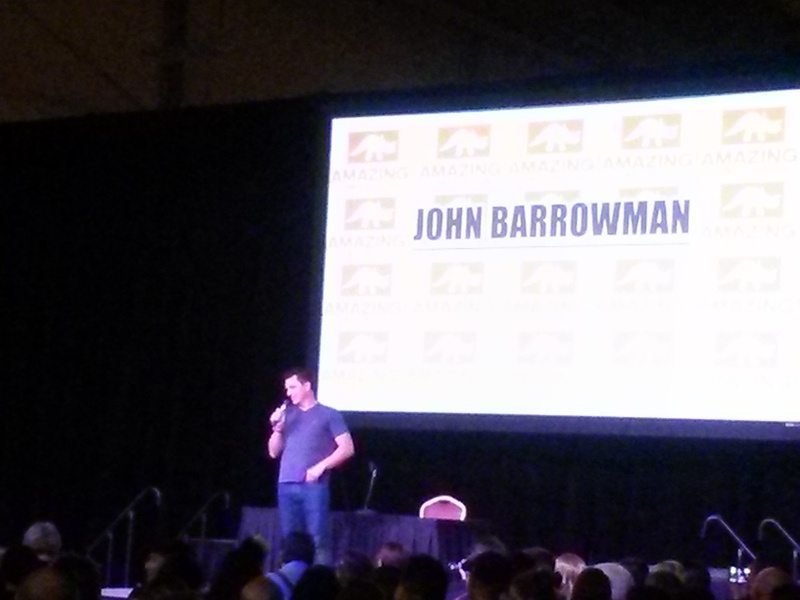 Saturday programming included the highly-publicized panel with Deadpool creator Rob Liefield, as well as a panel with the always charming John Barrowman. The only downfall was that the big panels were held on the concourse in a curtained off area. The big panels were standing room only, even though the area could have been expanded. I think that it would be great to make the area bigger, since the space was available and not limited to the confines of a room. 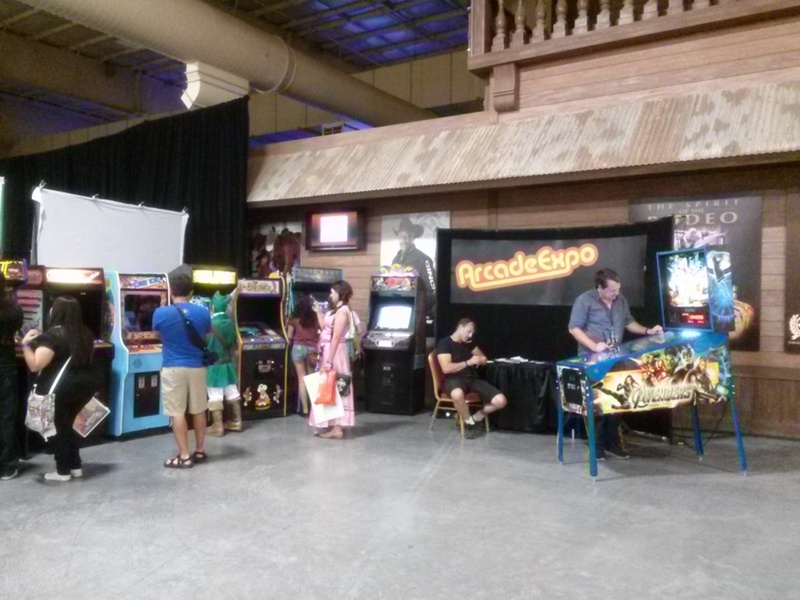 The noise level was also an issue because there were booths and games directly outside of the curtains. The last event of the night on Saturday was the costume contest, where all of the cosplayers came out to display their awesome costumes. The judges were looking for more than just costumes; they also took into account the craftsmanship of the costumes. The best in show winner was Oberon Martel, from Game of Thrones. Oberon was wearing a handmade leather costume that he hand-tooled himself. It was quite impressive, and it was nice to see that his hard work paid off. 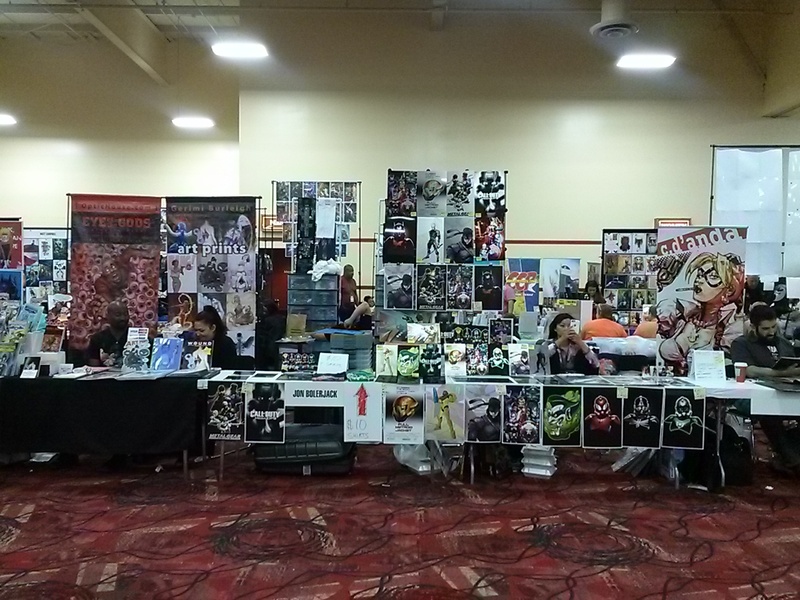 In my opinion, ALVCC is the perfect comic convention in terms of size, content and exhibitors. There was enough going on to keep me busy all weekend. I don’t know the final attendance numbers but I do know that the parking lots were full on Saturday, and yet I didn’t get the claustrophobic feeling in the Exhibit Hall that I’m used to at SDCC. 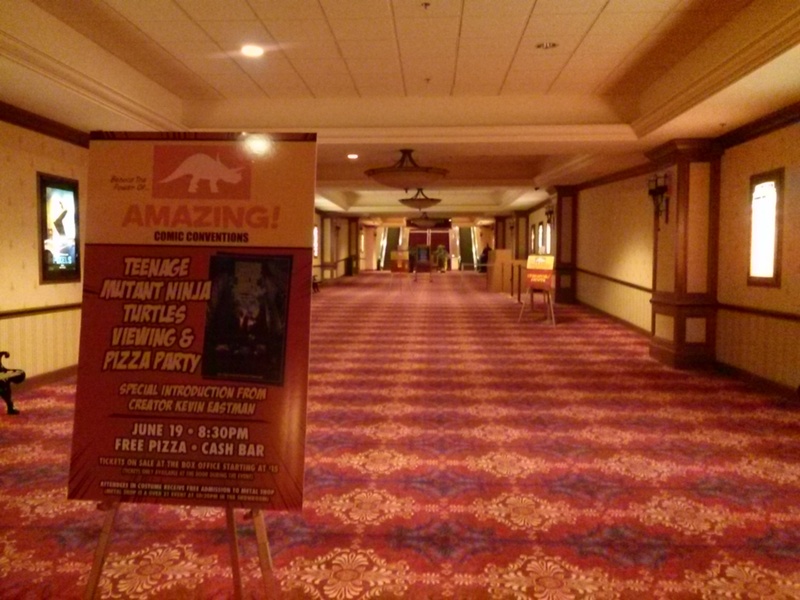 There was plenty of space for everyone, and having that space made it easier to meet and greet artists and exhibitors. And having a “self-contained” convention was nice, too. 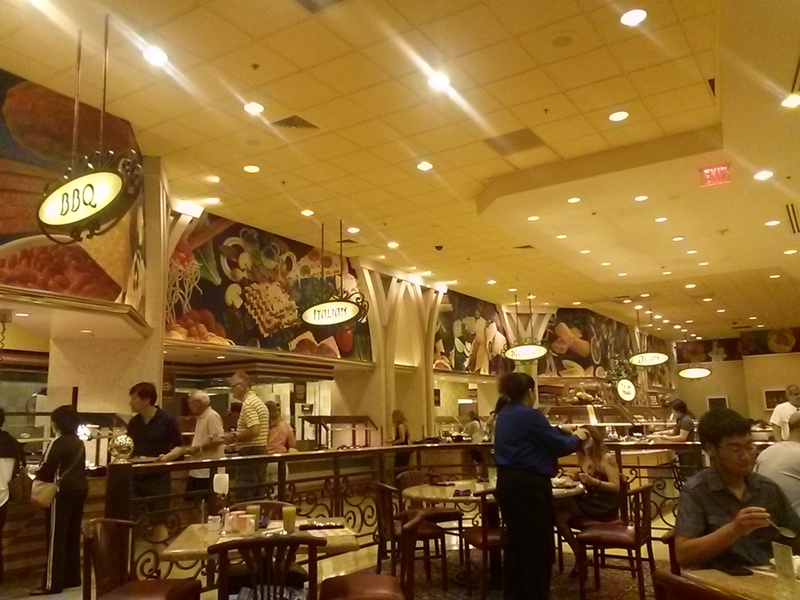 The South Point has a midnight breakfast special, and there was a huge line of ALVCC people waiting to get in. It was awesome. Every elevator, blackjack table, and restaurant was full of costumed fans. 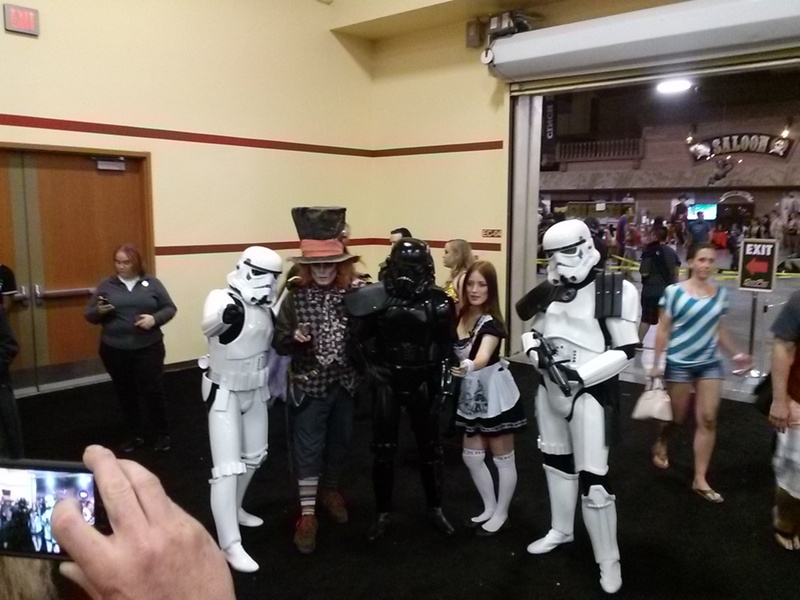 Vegas is fun in and of itself, but add a comic con and it gets even better. At one point we were out on the Strip late at night and we ran into a trio of Halo cosplayers. It was great. 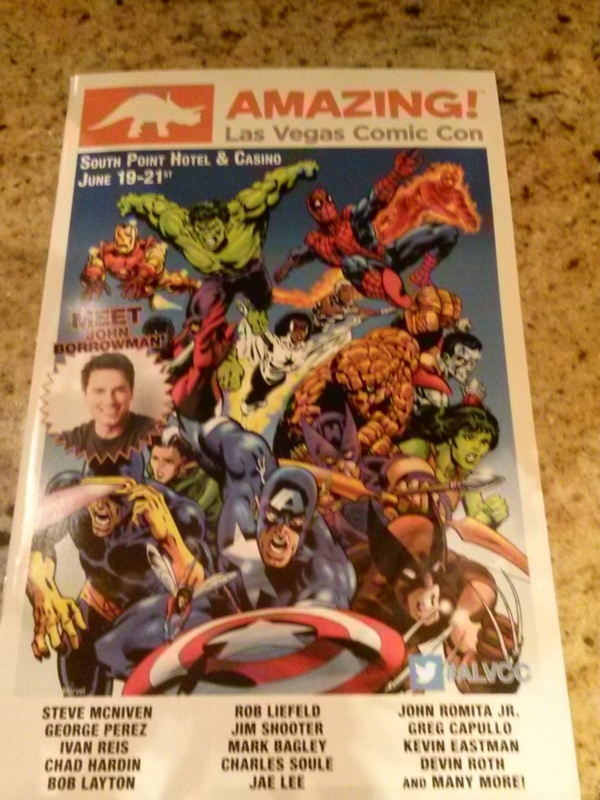 If you haven’t been to Amazing Las Vegas Comic Con, make plans to be there in 2016. It’s, well…amazing!